Tailgating is a sport of its own, with more than 70 million Americans hosting or attending tailgate parties to root on the home team. But here’s the Game Day dilemma: How can you enjoy yourself and serve up great-tasting food without racking up the calorie and nutritional penalties? Julie Upton, MS, RD, CSSD from Appetite for Health is here to help with a winning strategy. The four food groups of football—beer, wings, pizza and chips and dip can really pile on calories. In fact, a tailgate party can set you back some 1,500 calories—and that’s all before kickoff. By the fourth quarter, it’s not uncommon to eat and drink several days’ worth of calories. Some simple substitutions in your Game Day menu can make you the “MVP” of the party. Here’s what to serve and what to sideline, and several winning recipes to try. Blitz on Chips and Game Day Dip: Opt for baked chips instead of fried to slash calories and fat and make your dips with nonfat plain Greek yogurt in place of sour cream. Using a cup of nonfat Greek yogurt in place of regular sour cream shaves off 315 calories and 45 grams of fat from your dip recipes. Wings pack in about 75 calories—not counting the dip! 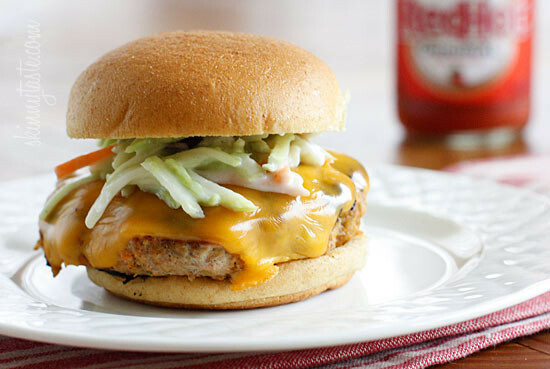 Bench Wings and Put Burgers on Your Playbook: For a main course to serve and ones to sack, go with burgers made from ground sirloin or 95% lean ground beef; or make a turkey or salmon burger. If you’re serving pizza, make sure it’s veggie-rich and ask for half the cheese and meat toppings. 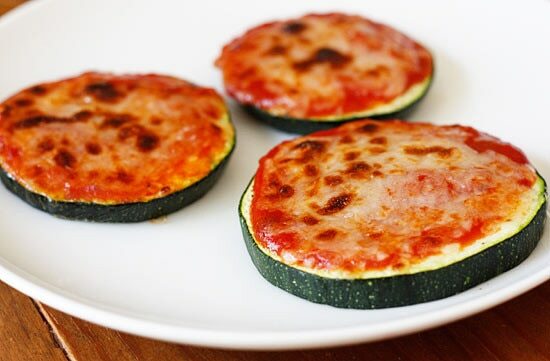 Or eliminate the bread altogether and serve these Zucchini Pizza Bites. Score with Extra Light Beer: As an official food group of football, beer is required if it’s a real football party. There are 150 calories in a bottle of regular and 95-100 in most light beers. But if you try a new extra light choices, like MGD 64, Budweiser Select 54 or Beck’s Premier Light you’ll not only have a skinnier sip, you’ll help damper the appetite-stimulating impact of alcohol. Oh my gosh!! !I think you just provided the solution to saving my hubby's waistline this football season. If I can get him away from the pints of ice cream we will be in business. Can't wait to try some of these ideas and what super tips!!!! I definitely want to try some of these, and gotta say, Becks is the way to go for light beer! Such a good flavor for the low amount of calories! 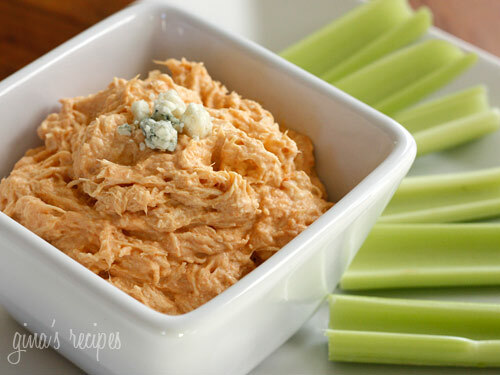 I haven't made your buffalo chicken dip in awhile but it sooooo good, I'll have to break that out again! I've made it for several family parties and no one knows it's skinny! Gina, Can you make over pizza dip? Its one of my favs! I was thinking that would be fun, but not sure how easy that one is to lighten. I have tried to use the low fat cheeses to do pizza dip and its never turned out good, would LOVE to see a recipe for a skinny version that actually tastes good! I also love your skinny jalapeno poppers. So delicious! I also use your bacon wrapped chicken for gameday! Wow..I am hunggry..I like it p;ease help me..lol. Looks good, but this is an old recipe. Can you do something new?? It's a round up. But sure, I'll come up with something new soon for you football fans. I wanna try your skinny buffalo chicken dip! Omg thises things looks so so so yumyum! I need to make these for my friends at the next sleepover!!! 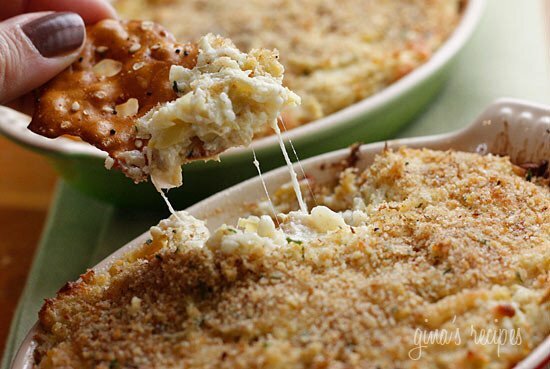 I love your skinny buffalo chicken dip!